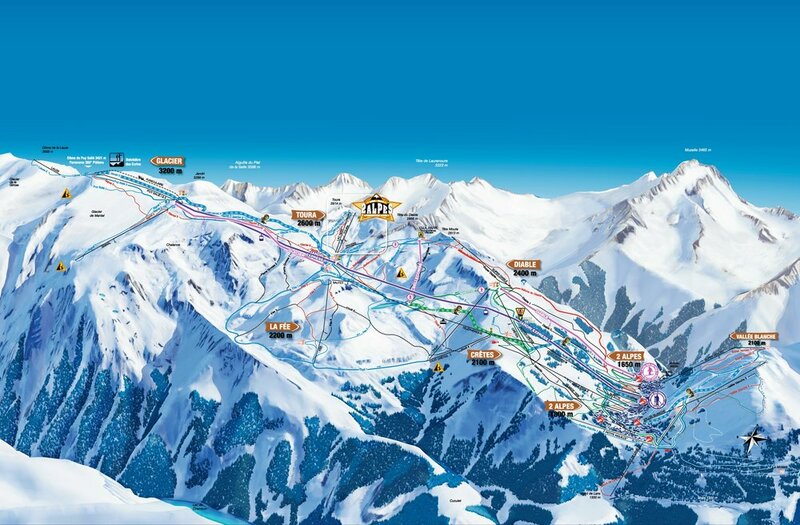 Alpe d’Huez forms part of the Grande Rousses ski area combining the resorts of Auris-en-Oisans, Huez, Vaujany Oz-en-Oisans and Villard Reculas. Alpe D’huez is situated on a south-facing plateau, at the foot of the Grandes Rousses mountains at an altitude of 1860m, offering a magnificent view over the famous peaks of the Oisans region, the Meije, Mont Blanc and the Aiguilles d’Arves. With an altitude drop of approximately 2200m, the ski area of Alpe d'Huez offers challenges for all levels spread over 250 km of ski slopes. The 133 ski slopes (43 green, 34 blue, 40 red and 16 black) descend between the ‘Pic Blanc’, the Sarenne glacier, La Fare and the Château Noir and are linked by means of a network of 84 ski lifts (including cable cars, chairlifts, drag lifts and magic carpets). Amongst the many pistes, the Sarenne ski slope is the most famous being the longest ski run in the world! This wonderful ski run takes you all the way from the glacier to the ski resort of Alpe d’Huez itself, over a distance of 16 km! 900 snow cannons ensure maximum snow-coverage for 86 km of ski slopes in the Alpe d’Huez ski area. Cross-country or Nordic skiing fans will appreciate the 50 km of tracks in and around the resort of Alpe d’Huez making up a total of 15 circuits beside the lake of Besson, beyond the Maronne mountain pass or on the crest of the Signal mountain. A special off-piste area of 21 hectares is completely dedicated to free-riders of all levels. You also have the choice of 2 snowparks, one for beginners and one for advanced freestylers. For less experienced skiers and snowboarders, the beginners' snowpark has a series of boxes and rail-boxes plus a ridge and other installations. A recent new edition is the fantastic Luge On Rails with virtual reality helmets! Alpe d’Huez boasts some of the most stunning and widespread skiing in the Alps. With a good snow record, ranked amongst the best family ski resorts in Europe and generally good weather what better place for a ski holiday. Les 2 Alpes is a vibrant ski resort and an absolute paradise for lovers of snow sports Because the glacier rises to 3,600 metres' altitude, Les 2 Alpes ski area is always guaranteed real snow - and with 425 hectares of marked pistes (10 hectares no groomed), it's pure bliss for snowsports-lovers. Its position high up in the Ecrins mountain (in Oisans) range makes Les 2 Alpes one of the highest skiable summits. One spectacular run starts from the glacier at 3,600 m and descends 2,300 m to the village of Mont de Lans at an altitude of 1,300 m - without skiers once needing to use a ski lift! If you're looking to get away from it all and enjoy an unforgettable snowsports holiday surrounded by beautiful scenery, then Les 2 Alpes is the place for you!